It’s history in the making come August 27 and August 28, as it is during these dates that the Indian National Cricket Team is set for a major Twenty20 cricket series with West Indies. Team India has most of the momentum with their taking the number one spot after the loss of Australia to Sri Lanka. West Indies, however, are no pushovers, and even though they’re currently ranked eighth, they’ve shown in the past that they can beat India. This is why no less than team captain ViratKohli said that the team has to play good consistently in order to secure their place. Nonetheless, it would be MS Dhoni who would be leading the national Indian Cricket Team, while Carlos Brathwaithe would be the captain of the West Indies team. This comes after the departure of Darren Sammy, who notably led the WI team in winning two titles in the World T20 series. Brathwaite, albeit being a relatively new leader, is expected to inspire his fellow teammates with his consistent commitment and humble approach to playing. He has been widely acclaimed for being the key to West Indies' triumph over England in the World T20 Finals that was hosted in Mumbai this year. As for Team India's squad, the Dhoni-led team that was finalized and announced early this month remains pretty much the same 14-member roster that played and won 2-1 against Zimbabwe last June. This undoubtedly sensational series between the World T20 champions’ vs the best in the format team would take place at Central Broward Regional Park Stadium in Florida, USA. This is also the first time in history that the U.S. is hosting the T20 Cricket series, which is part of the reason why many cricket fans in the US are hyped to see these two exceptionally skilled and talented teams collide live. This also marks the debut of Indian cricket on American soil. With that said, history is bound to be made once the two teams clash near the end of the month, and they are expected to deliver nothing less than the most exciting matches for the fans. WI VS IND T20 Live is scheduled to start at 10 am local time on the said dates. For live streaming and broadcasting, know that YuppTV has gained exclusive rights to pretty much all the T20 match series. 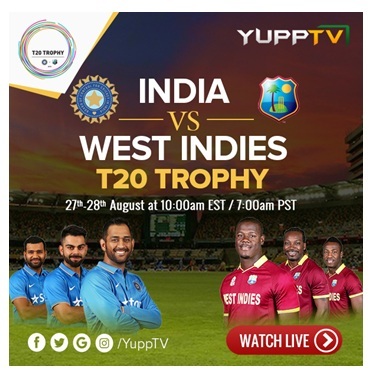 YuppTV offers T20 Live Streaming of Team India vs West Indies in the USA, Canada, and the Caribbean countries. This is why if you’ve been meaning to watch IND VS WI T20 live, then this is definitely one of the best platforms that you can choose to avail of in order to not miss out on these two landmark matches in the world of cricket.